The Eltek Modular HE DC Power System, powered by the Flatpack2 line of power modules, delivers up to 1200A in a compact, rack-mount unit. Use of the highly-efficient and reliable Flatpack2 rectifier, a variety of configurable distribution layouts, and the advanced Smartpack2 controller make for optimal system design and cost-effective deployment. 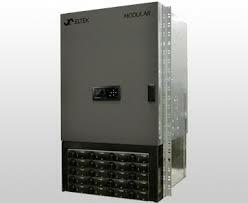 The Eltek Modular HE DC Power System is a high-efficiency power solution with an optimal 23″ rack-mount footprint. It is designed for applications between 600A and 1200A at both 48Vdc and 24Vdc output. The modular system can power both single-voltage telecommunications infrastructure (such as -48V LTE or +24V legacy TDMA) as well as dual-voltage sites. DC to DC converters are available for converting 24V to 48V (or vice-versa) within a single modular system. Configurable design – Both large and small breakers and fuses can be utilized by configuring up to four distribution panels, potentially using up to 96 small breakers and fuses. Integrated AC Input box – AC input terminal options include compression terminals and barrier strips. Digital controllers – The Smartpack2 digital controller system provides comprehensive monitoring and regulation by utilizing a variety of specialized data collection devices. Heat management – Flatpack2 modules feature front-to-back airflow and chassis-integrated heat-sinks, supplementing high-efficiency energy conversion with excellent heat management. Cost-efficiency – A true plug-and-play system, the modular system reduces both time-to-install and overall costs. Click here for more detailed specification information.